When it comes to the Kodak Z980, it’s all about the zoom, or more appropriately, the megazoom. On offer, is a 26-millimeter wide angle lens with a monstrous 24x image stabilised optical zoom. There’s also a 12 megapixel sensor underneath its chunky exterior, a vertical shutter release, high definition video and picture capabilities and a detectable vertical grip. As well as the above, it comes equipped with Kodak’s Smart Capture feature for automatic camera adjustments and a Schneider-Kreuznach lens to give the camera more pizzazz. So, if you’re “looking for more from your digital camera, you’ll find it in the Z980”. It’s due in the Spring when it’ll retail for around $399.95 USD. 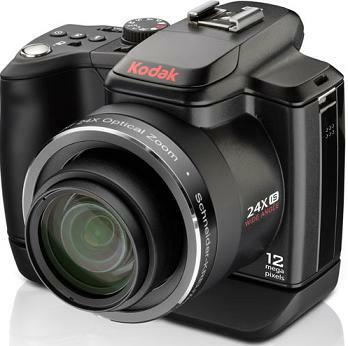 Kodak also unleashed another addition to its M-Series digital cameras – the M380. Think 10 megapixels, 5x optical zoom and a 2.7-inch screen. Its due month is March and it’ll be available in black, red and teal for a cool $179 USD. But no picture I’m afraid.